Jordy Ray Nelson (born May 31, 1985) is an American football wide receiver for the Green Bay Packers of the National Football League (NFL). He played college football at Kansas State, and received All-America honors. Nelson was drafted by the Packers in the second round of the 2008 NFL Draft. He is regarded by sports analysts as being one of the few elite receivers in the NFL. Nelson was born in Manhattan, Kansas, to Alan and Kim Nelson, farmers who lived in Riley and had season tickets to Kansas State football games. He attended Riley County High School in Riley, Kansas, and played football for the Falcons. During his senior year playing quarterback, he completed 62 percent of his passes for 1,029 yards and eight touchdowns. Nelson also rushed for 1,572 yards, averaging 9.8 yards per carry with 25 touchdowns. He was named Flint Hills Player of the Year by the Manhattan Mercury. In 2003, he played in the Kansas Shrine Bowl. He was also an all-state basketball player, averaging 17.2 points per game his senior year for the Falcons. Nelson was an outstanding track and field athlete, and won a national AAU championship in the 400 meters as a 10-year-old. In 2003, his senior year at Riley County High School, he won the state titles in Class 3A in the: 100 meters, with a time of 10.63 seconds; 200 meters, with a time of 21.64 seconds; 400 meters, with a time of 48.79; and long jump, with a leap of 7.00 meters. Nelson attended Kansas State University, where he played for coach Bill Snyder's Wildcats football team from 2003 through 2005. When Snyder retired after the 2005 season, Nelson remained with Kansas State and played the rest of his college career (2006 and 2007) under Ron Prince. Nelson began his college career as a walk-on at Kansas State, and took his redshirt year as a member of the Wildcats' 2003 Big 12 Championship team. He was set to play defensive back in college, but during spring practice following his first year, Snyder moved him to wide receiver. During his sophomore campaign, Nelson caught 45 passes for eight touchdowns, elevating expectations for the junior wide receiver as he was listed on the Biletnikoff Award watch list. Injuries kept him off the field most of his junior year, leading to a disappointing junior season, in which he caught only 39 passes for one touchdown. After going unnoticed his junior year, Nelson broke out during his senior year, and was among the nation's best receivers. He earned consensus All-American honors, and was a finalist for the Biletnikoff Award after catching 122 passes for 1,606 yards and 11 touchdowns. Nelson also showed his versatility by throwing two touchdown passes and returning two punts for touchdowns. Nelson was selected in the second round (36th overall) by the Green Bay Packers in the 2008 NFL Draft. He was the third receiver taken. On July 27, 2008, he signed a contract with the Packers. Nelson scored his first touchdown reception on September 14, 2008, a 29-yard pass from quarterback Aaron Rodgers. A second followed in Week 14 against the Houston Texans. Nelson finished his rookie campaign with 33 receptions for 366 yards. In 2009, Nelson played in 13 games for the Packers, catching 22 passes for 320 yards and two touchdowns. He also saw action as the primary kick returner for most of the year. In 2010, Nelson set career highs in receiving yards (582) and catches (45), while catching 2 touchdown passes for the third straight year. Following the injury to Aaron Rodgers against the Detroit Lions on December 12, 2010, it was revealed that Nelson was third on the Packers' quarterback depth chart. After strong outings in the 2010–11 playoffs against Atlanta and Chicago, Nelson caught a 29-yard touchdown pass on third-and-1 with William Gay covering, for the first score of Super Bowl XLV. "This was Jordy last week: 'I think we need to convert on third downs to win the game.' ... Rodgers threw a terrific pass, capping an 80-yard touchdown drive," a live-blog reported. In the balance of the game, Nelson struggled some and made no more touchdowns. However, he recovered from a dropped pass early in the fourth quarter to make a 38-yard play on the next down, taking the Packers to the Steelers' two-yard line. Nelson was the top receiver of the game with nine receptions for 140 yards (both career highs), while also gaining 19 more yards on a kick return. Coming off his strong Super Bowl performance, and a good start to the 2011 season, Nelson signed a three-year, $13.35 million contract extension early into the season on October 2, 2011. Nelson finished the 2011–12 regular season with career highs in touchdowns (15), receptions (68), and receiving yards (1,263). He had a career-high three touchdown receptions in the season finale against the Detroit Lions, and moved into sole possession of third place for most receiving touchdowns in a single season in Packers franchise history, behind only Sterling Sharpe (18) and Don Hutson (17). He was named a Pro Bowl alternate. In 2012, Nelson played in 12 games, starting ten; he missed four games and most of another two due to a hamstring injury. He had 49 receptions for 745 yards and scored seven touchdowns. In 2013, Nelson posted career highs with 85 receptions for 1,314 yards (a 15.5 average) and eight touchdowns. He started all 16 games for the first time in his career and was again named a Pro Bowl alternate. During Week 2 against the New York Jets, Nelson had nine receptions for a 209 yards. It was his first career 200-yard receiving game as the Packers defeated the Jets, 31–24, despite having trailed 21–3. He also became the first Packer since Javon Walker in 2004 to have 200 or more receiving yards in a single game. With 1,519 receiving yards on the season, Nelson passed Robert Brooks to capture the Packers' receiving yards in a season record. In a Week 2 preseason game against the Pittsburgh Steelers, Nelson caught an eight-yard pass from Aaron Rodgers, but then fell to the turf without contact. He limped to the sidelines with an apparent knee injury and did not return to the game. MRI scans deemed that Nelson had torn the ACL in his right knee and would remain inactive for the rest of the 2015 season. 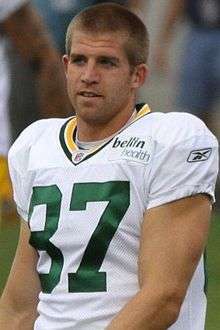 Jordy Nelson married his longtime girlfriend, Emily (née Rothlisberger), in 2007, after proposing on a family vacation to Cancun. Emily played basketball at Bethel College (Kansas). The couple have two sons, Royal and Brooks. On August 20, 2015, Nelson's alma mater, Kansas State, revealed that they will name their football team's locker room the "Nelson Family Locker Room" after him, after Nelson donated an undisclosed amount to renovate their athletic facilities. ↑ Smith, Michael David (August 8, 2012). "Packers' coaches consider Jordy Nelson "an elite receiver"". profootballtalk.nbcsports.com. Retrieved 2014-10-13. ↑ Wesseling, Chris (2013-10-10). "Dez Bryant climbing ATL's wide receiver rankings". NFL.com. Retrieved 2014-10-14. ↑ "Brady Poppinga: Packers' Jordy Nelson Is Best Wide Receiver In NFL". November 20, 2014. Retrieved September 18, 2016. ↑ Imig, Paul. "Dynamic duo: Green Bay Packers' Randall Cobb, Jordy Nelson among league's best WR pairs". Retrieved September 18, 2016. ↑ "FBF BREAKDOWN: Jordy Nelson". Retrieved September 18, 2016. 1 2 3 "Green Bay Packers: Jordy Nelson". Retrieved September 18, 2016. ↑ "2003 Roster". Kansas State Athletics. kstatesports.com. Retrieved 2014-10-14. ↑ "2004 Roster". Kansas State Athletics. kstatesports.com. Retrieved 2014-10-14. ↑ "2005 Roster". Kansas State Athletics. kstatesports.com. Retrieved 2014-10-14. ↑ "Bill Snyder Quotes From Press Conference". Kansas State Athletics. kstatesports.cstv.com. Retrieved 2014-10-14. ↑ "2006 Roster". Kansas State Athletics. kstatesports.com. Retrieved 2014-10-14. ↑ "2007 Roster". Kansas State Athletics. kstatesports.com. Retrieved 2014-10-14. ↑ "Ron Prince Will Not Return for 2009". Kansas State Athletics. kstatesports.cstv.com. Retrieved 2014-10-14. 1 2 3 "Jordy Nelson Stats (college)". ESPN. Retrieved October 27, 2015. ↑ "KSU Wildcats - Football". Retrieved September 18, 2016. 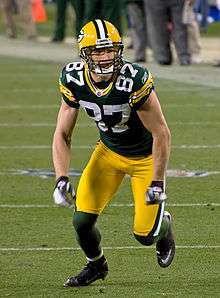 ↑ "NFL Events: Combine Player Profiles - Jordy Nelson". NFL.com. Retrieved August 25, 2016. ↑ "Jordy Nelson - Kansas State, WR : 2008 NFL Draft Scout Player Profile". NFLDraftScout.com. Retrieved August 25, 2016. ↑ "NFL Draft 2008 - Jordy Nelson". NFL.com. Retrieved August 25, 2016. ↑ "Packers sign draft picks Nelson, Brohm and Lee". Packers.com. July 27, 2008. Retrieved October 6, 2016. 1 2 3 "Jordy Nelson Stats (NFL)". ESPN. Retrieved October 27, 2015. ↑ "Jordy Nelson Stats, News, Videos, Highlights, Pictures, Bio - Green Bay Packers - ESPN". espn.go.com. Retrieved October 14, 2014. ↑ Covitz, Randy, "Packers’ Nelson has gone from small-town Kansas to Super stage", The Kansas City Star, February 1, 2011, 10:36 PM CT. Retrieved 2011-02-06. Archived February 4, 2011, at the Wayback Machine. ↑ New York Times staff (February 6, 2011). "Live Analysis: Super Bowl XLV, Packers Beat Steelers, 31-25". New York Times Fifth Down blog. Retrieved October 14, 2014. ↑ Hubbard, Jan,"Packers' underrated Nelson nearly winds up MVP", Kansas City Star, February 7, 2011 12:35 AM. Retrieved 2011-02-08. ↑ Layden, Tim (February 14, 2011). "Green And Golden: Behind the poise and precision of quarterback Aaron Rodgers and the gutsy contributions of a host of role players, the Packers burnished their championship legacy with a memorable 31–25 victory over Pittsburgh in Super Bowl XLV". Sports Illustrated. Time Inc. Archived from the original on October 29, 2013. Retrieved 2014-10-14. ↑ "Super Bowl XLV boxscore". NFL.com. Retrieved 2014-10-14. 1 2 "2014-packers-83-268.pdf" (PDF). Retrieved September 18, 2016. ↑ Patra, Kevin (2014-07-26). "Jordy Nelson, Packers strike 4-year, $39M contract". nfl.com. Retrieved 2014-10-14. ↑ "Source: MRI shows Jordy Nelson's injury only to ACL in right knee". ESPN. August 24, 2015. Retrieved August 24, 2015. ↑ Jordy Nelson. "Green Bay Packers: Jordy Nelson". Packers.com. Retrieved 2014-01-05. ↑ "Jordy Nelson, Green Bay Packers". Fellowship of Christian Athletes. fca.org. 2011-11-01. Retrieved 2014-10-14. ↑ "Jordy Nelson makes gift to Kansas State Wildcats". Retrieved August 20, 2015. 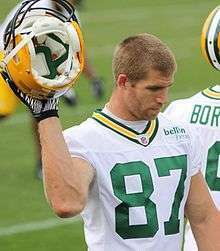 Wikimedia Commons has media related to Jordy Nelson.